You can move a design from one page to another. This helps to quickly start a new, similar design. For example you can duplicate an existing design, move the duplicate to the desired page, and then modify the duplicate. This process is usually faster than duplicating the page. If you want to reuse an identical design for multiple pages, you should use a template instead. Refer to Using Templates for more information. 3. Select the design to be moved. 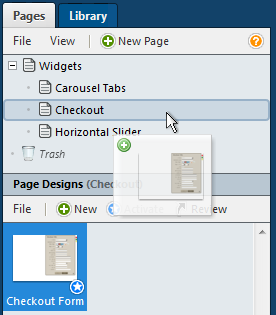 Drag the design from the Page Designs pane, and drop it on a page. As shown below, you move designs by dragging them from one page to another.